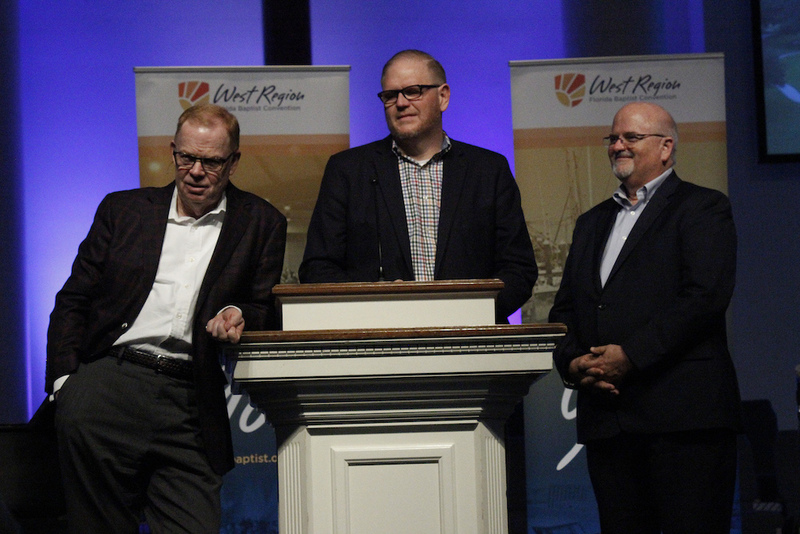 Traylor, Coleman, and Miller answered questions during the West Region Evangelism Conference held at The Baptist College of Florida. 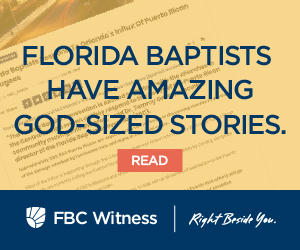 With the registered trademark of “Changing the World Through the Unchanging Word®,” it should come as no surprise that The Baptist College of Florida (BCF) in Graceville places a strong emphasis on evangelism. For this reason, the college was pleased to host the evangelism conference on March 11, in the R.G. Lee Chapel. This year, the conference theme was Who’s Your One?. Students, staff, faculty members, and guests began to fill the chapel pews right before 4:00 p.m. While waiting for the event to begin, they inspected the contents of the free resource kit they were given at the door. The kit was complete with a journal, pen, and USB flash drive that contained access to various evangelism resources. BCF President Thomas A. Kinchen began the evening with a brief welcome in his characteristic jovial manner. Lewis Miller, the West Regional Catalyst for the Florida Baptist Convention introduced the theme for this year’s conference and presented special guest speakers Tim Coleman, Senior Pastor of Point Baptist Church in Pensacola and Ted Traylor, Senior Pastor of Olive Baptist Church in Pensacola. The first half of the evening was used as a teaching time and included an interactive question and answer segment. Coleman taught specifically about the necessities of praying for boldness and stressing the importance of the exclusivity of Jesus Christ as the means of salvation when attempting to evangelize, using Luke 4 for reference. He then led the congregation in a time of focused prayer. Traylor shared how pastors need to lead “on mission” by developing a culture of evangelism in their churches. Churches are to gather on mission as they prepare to go out, and individual members need to live on mission as they seek opportunities to share the gospel and serve others. Miller, Coleman, and Traylor concluded the first session by answering a broad range of questions that the audience asked concerning effective evangelism. Conference guests were provided a free steak dinner in the Deese Center before returning to the R.G. Lee Chapel for the final session of the conference. Worship Leader Jamie Evans and the Praise Team from Olive Baptist Church led the congregation in a powerful time of musical praise and worship. The evening was highlighted by thought-provoking and application-demanding sermons that model evangelism delivered by Coleman and Traylor. Guests left the conference equipped with the materials and knowledge needed to take part in active and effective evangelism. God used this event to renew the passions of His people to reach their “one” and see His Kingdom expand.